Picasso said, “I begin with an idea and then it becomes something else.” This is a sentiment that many abstract artists can relate to and draw comfort from as their work deviates from the original vision into what it ultimately becomes. From the point of view of five Colorado-based artists, Kristen Abbott, Deidre Adams, Molly Berger, Jessica Magee, and Julia Rymer, Chasing 360 explores the full magnitude of the artistic and creative process. The inspiration for this exhibition evolved out of the artists meeting to connect about their work and process. 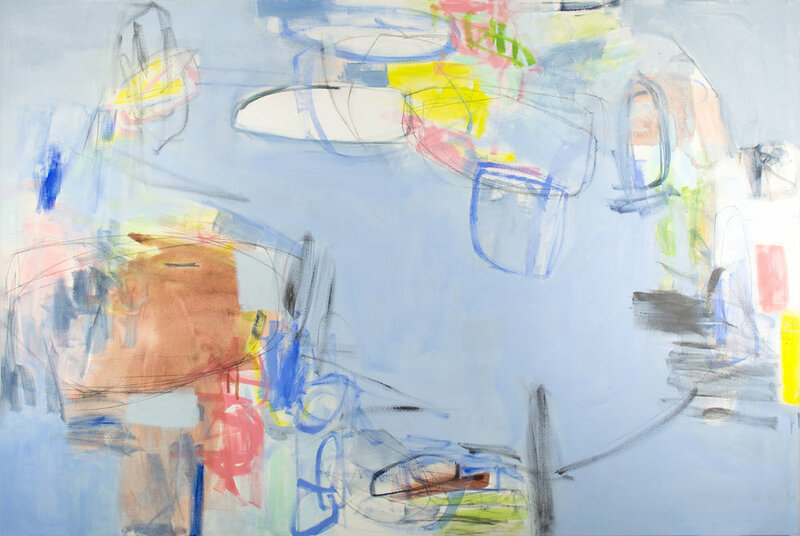 Artist Jessica Magee coined the phrase “Chasing 360” as a metaphor for the feeling an artist has as they work- in a sense, as if they are chasing their tail or running in circles. While some artworks seem to come together effortlessly, often there are a multitude of variations and experimentations before a painting finally comes full circle and feels “finished.” The artists included in “Chasing 360” allow themselves to surrender to this process, making the resolution in their work unpredictable and intriguing. A thread running through the on display is a dedication to craft, process, and experimentation, to failure and success, and to seeing each piece through to its own conclusion. In conjunction with the artwork itself, each artist’s physical and digital inspirational ephemera will be on view, illuminating their personal creative journeys. From experimental color palettes, sketchbooks and preparatory studies to the digital imagery that infuses daily life, each artist in the exhibition will share the impetus and meaning that exists in their work and how it comes to be. Ultimately, Chasing 360 will give the viewer insight into the artistic process, allowing them to fully appreciate the artists’ works in totality, and gain deeper understanding into the complexity of a work of art’s evolution.